For those of you who read the first Daleville Dan entry, you can rest assured that he finally managed to rid himself of those pesky cats. But it didn't take long for Dan to find his way into another hornet's nest full of political injustice and social disparity. You see, Daleville Dan discovered a wonderful new hobby and possible job source - electronic bingo. Oh, yes. A new electronic bingo hall, or entertainment complex as some might say, opened in his local area. Daleville dan had a blast and spent loads of his hard-earned money at the new place for more than two weeks ... until the Po Po came and shut it down. It seemed that some folks in the state government considered this form of entertainment gambling. "Heck, it's just bingo," Dan thought. "What harm could possibly come from putting money into a machine, pulling a lever, and waiting to see if the tumblers fell just right giving the player a jackpot, uh, er, I mean bingo! So Daleville Dan, for the first time in his life, decided to join the cause. Daleville Dan packed up some food, locked up his single-wide, and gassed up the truck before high-tailing it all the way to Montgomery, the state capitol, to protest these polititians who were so asinine as to think his beloved electronic bingo devices were simply slot machines. 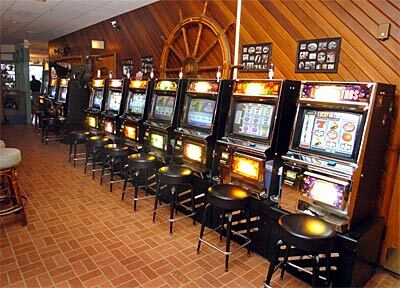 "How can they possibly be slot machines," Dan thought. "Anyone can plainly see the bingo card shown on the machine." Unfortunately Dan is still fighting the good fight and, now, his plight has become even more serious. "They just got to get some sense and get those machines back," Dan now tells everyone who will listen. "I need to win me some money so I can pay my new health insurance premiums."